Sometimes the easiest of meals can seem a little daunting. A frittata just sounds too complicated by the name but I can assure you, this one is easy. 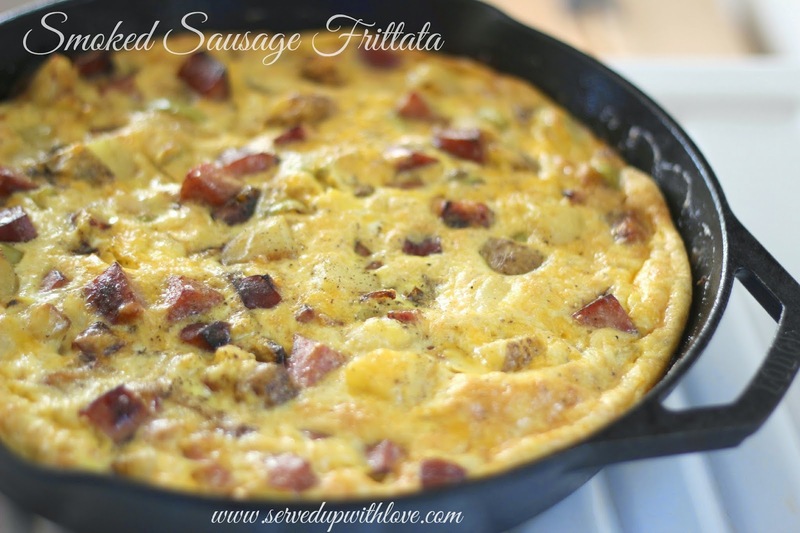 Basically a frittata is a large omelet cooked in one pan. Who doesn't love just messing up on pan? You can really just throw anything in here and it would turn out good. You will want to cook this just a bit on the stove top and then place in the oven. Make sure you use a pan that is oven friendly. I like to use my most favorite pan, my cast iron skillet. With a simple change up of ingredients this recipe can be transformed into something different. The possibilities are endless. Perfect for breakfast, brunch or even dinner. I think eating breakfast food for dinner tastes much better than it does first thing in the morning. Chop the smoked sausage link (I chopped into a small dice). Chop the green pepper and onion and add into an oven safe skillet with a tablespoon of olive oil along with the smoked sausage. Cook in the skillet until lightly brown. In a separate bowl add the eggs, cheese, and salt and pepper. Add the egg mixture into the skillet and move the sides of the eggs to the middle to allow more eggs to cook. Do not scramble the eggs. Cook for 3-4 minutes and then place in a 375 degree oven for 5-10 minutes. Ovens vary and some may take longer. Make sure the eggs are cooked. The middle takes the longest to cook. Insert a knife to check for doneness. You can invert this onto a serving platter or serve directly out of the pan.